Standard Sheet Counts: Available in 25 and 50 sheets per pad. Imprint Areas: 7 5/8" x 2 5/8", 2 5/8" x 7 5/8"
5-working-days! Adding a magnet to the back of the 3" x 8" notepad increases production time to 7-working-days. 2-day service at ground rates. BIC Air Express 1 Day Air. Since BIC Sticky Note products are heavy, please Click here for complete shipping information. Adhesive Side: Adhesive is available on the 3" side OR the 8" side. Adhesive is on the 3" side of the 3" x 8" pad. Adhesive is on the 8" side of the 8" x 3" pad. 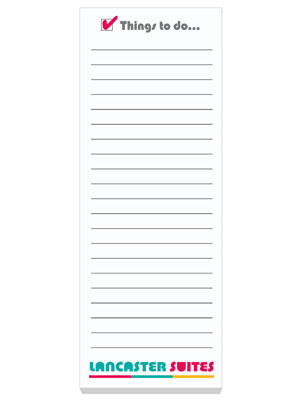 Add a magnet to the back of your 3" x 8" notepad for the ultimate convenience! Add $.20 per pad. The perfect pad for lists and notes!